Don't Forget The Older Generation! I did. What's So Big About The BIG Y Test? Where Did All The German-Americans Come From? If you can't test both parents, of course - I've tested both my parents and thus haven't tested my siblings. There's a few reasons to do so even though, as Tim Janzen points out for phasing purposes, but these are for very advanced phasing purposes. When recording the information that can illuminate your family history, the autosomal DNA of your family's oldest generation gives the longest view back into your ancestry. I wrote the earlier post with my own personal blinders firmly in place. 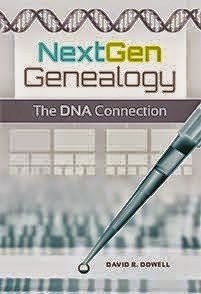 By the dawn of atDNA testing for the general public in 2010, I was the older generation in my family. To compound my situation. I am an only child and therefore have no siblings to test. From that perspective I was challenged by Judy Russell and Thomas Jones at RootsTech 2014. Judy very effectively demonstrated how knowledge of our family members can disappear forever within 3 generations unless we care enough to record and preserve it. Dr. Jones likened DNA to the oral histories that too often disappear unrecorded with each of the members of the older generation of our families as they pass on. So far no one has challenged the math of "Should I Test My Siblings Also?" There is still plenty of time to help me refine my calculations in that post. In the meantime I will throw some more out to you to review. First let me say this is not an either/or proposition if you are fortunate enough to have a choice of family members to test. Today atDNA tests are relatively inexpensive but cost is always an issue. How do you set testing priorities? Blaine was correct. If you are fortunate enough to have autosomal test reports on both your parents, testing your sibling will only be of minimal value. Also Dave made a very good point about the importance of collecting the autosomal DNA of your uncles and aunts. The recombination of autosomal DNA through the generations quickly begins to make it difficult to trace shared segments back to commons ancestors. Every generation the person being tested is closer to that common ancestor, the more certain we can be about our conclusions. With yDNA and mtDNA that focus is not lost as quickly as the generations pass. However, it does become more difficult to find the right family member(s) to test to trace some of our lines. A video presentation by the principal author is available. For those of you who cannot get through the AAAS pay wall to see the article, this presentation may be a very adequate substitute. You may wish to see the video in any case. Benjamin Atticus Dowell joins his family in their Nashville backyard. Autosomal Dominant Inheritance: Brugada Syndrome; and Our DNA Day Miracle. Today, as Benjamin turns one month old, his story debuted in The Tennessean. This SNP fable is not literally true in all regards. It is a "fictumentary" based on what we know but liberties are taken to fill in blanks where science has yet to provide more definitive answers. I hope that each time I tell it there will be less fabrication and more scientific fact. SNP discoveries are now being made so fast that such an expectation is not impossible. SNPs are permanent changes in one location along the genomes of our ancestor that have been passed down to us. We can trace the accumulation of these SNPs, much as we could follow the paths of our ancestors backward in time as if they had left notches in tree trunks as they made their journey through time. This journey can be traced back thousands of generations. However, in the interest of time, I will fast forward down to the last four millennium or so. This is the story of the journey of my own paternal line as I am discovering it with my results from the BIG Y test. As most of you have discovered, all families who share the same surname are not recently related. In my case we discovered a decade ago in early ySTR testing that the Dowells who flourished in Southern Maryland in the late 17th century were not biologically related to those who flourished in Central Virginia in the early 18th century. The surname came into use independently in more than one location. However, these two clans who were to become Dowells had traveled down the SNP highway from the beginning of time until they separated as they approached the Atlantic coast of Europe about four thousand years ago. They were both part of the great R1b migration out of Central and West Asia sometime after the last ice age receded. For those of you who know a little about SNPs, both of these two groups who became Dowells belonged to R-L21 which is the most prevalent haplogroup along the western coast of Europe. The timeline is still fuzzy but a few hundred years later they were both part of the SNP DF13 that was the major branch below L21. Here they came to a parting of the ways that we are just now beginning to be able to decipher with results from tests of discovery such as BIG Y, Chromo2, Full Genomes, etc. These tests are still not for the casual genetic genealogists or the timid of wallet, but they are where the fast and furious action is. The trail of my own paternal line is being revealed to have branched off at SNP S1026. So far the Chromo2 project has discovered six individuals whose ancestors have passed this SNP down to them. Seven, including me, have been identified by the BIG Y test. And the number seems to grow weekly. So far my tale is more fact than fiction, but buckle your seat belts. The chart above is thought to describe the genetic journey of seven of us over the last 3,500 years or so. However, we don't know yet in what sequence each of us passed through these various SNP junctions. We will learn more about that as more members of this clan have test results. However, as of now it appears that each of us have approximately thirty or so SNPs spread out over a little more than three thousand years. That averages out to about one SNP junction every one hundred years. It appears at the moment that ancestors of the man whose path is second from the left never left France for the Isles. They stopped just short on the Brittany coast across from Cornwall. The ancestors of the rest of us appear to have made the plunge at some point in the last three thousand years or so. The ancestors of the man on the left seem to have made it to Ireland. The ancestral lines of the five of us on the right seem to have stayed together for another five hundred years or so. 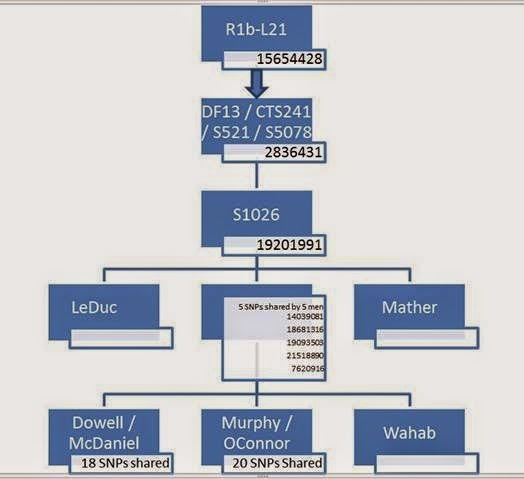 We all share 5 SNPs not shared by the two on the left. have heard that one before. I look forward to the opportunity to learn more about the journey of my own accumulation of SNPs. If you can correct what I have written or add to it, I would love to hear from you. That is how I learn. The old question "What are you going to do on your summer vacation?" hardly applies when one is supposed to be retired. Maybe a more appropriate question is "What genealogy activities do you have planned for your summer?" 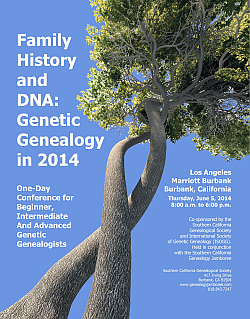 Dr. D is planning to open his genealogy summer with a visit to the left coast for Jamboree in Burbank. Although I will not be making a formal presentation there, I will be at Table #13 on Friday morning June 6th for an informal small group discussion of "Incorporating DNA Research into Genealogy." I would be delighted to have you drop by and share your research and a part of your morning with me. For the rest of the conference, I will be hanging out in the exhibits around the ISOGG booth and those of DNA test vendors. I'll even attend several of the programs -- particularly on Thursday which is DNA Day. Later in June we are trying to set up a welcome to the family for my 39th Adams 1st cousin. We are going to see how many of the surviving cousins can get together in Missouri to meet Jim for the first time. Jim who was adopted as an infant is now 81. We continue to work to help him identify his birth parents. For 6 Tuesday mornings in July and August I will be teaching a "Genealogy Research" class through the Osher Institute for Lifelong Learning at Vanderbilt University. If you are going to be in Middle Tennessee this summer, come on down. In mid-August I'll be on the right coast for the First Annual Conference of the Institute for Genetic Genealogy in Chevy Chase, MD. While we are there we hope to introduce our 10 year old grandson to his Nations' Capitol. Have you planned your genealogy summer yet? I hope our paths cross somewhere. Some of you may be in a similar predicament to the one I have been in for half a century. I know who my 6th great-grandfather is on my surname line; but I don't know anything about where he came from. My ancestor, Philip Dowell showed up as an established tobacco planter in Southern Maryland in the 1690s. The rest of his life until his death in 1733 is pretty well documented. My first DNA test back in 2004 was supposed to help. It didn't. Well actually it did. It told me I was not related to most of the Dowells who were in Colonial Virginia. 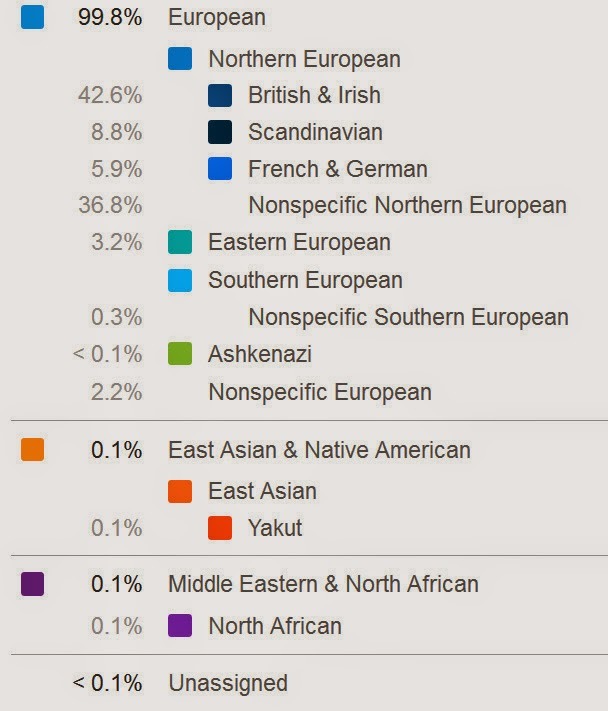 I wanted it to tell me who I was related to on the other side of the pond. On that question I have not really progressed much since 2004 or 1966 for that matter. Over the years I have been able to make connections with many of living descendants -- including straight line male Dowell descendants of three of his four sons who lived to produce offspring. By testing our yDNA and triangulating the results we have been able to reconstruct what Philip's 111 yDNA STR marker test report would have said if he had been tested by FTDNA. However, we really are not much closer to tracing his origins prior to 1690. Over the last decade we have made contact with a few other non-Dowells who are within spitting distance of Philip's yDNA signature at 67 and 111 STR markers. I was an easy recruit to take the BIG Y test when it was rolled out in November. My sixth cousin -- once removed, George Dowell and a more distant ySTR match, Herb McDaniel also decided to test. Many of you may know that R1b is the most common male haplogroup along the Atlantic coastline of Western Europe. One of its branches, L21, is very heavily represented in the British Isles. Many of those who have taken yDNA tests in the last decade have either been confirmed or at least projected to belong to the L21 group. For those of you who are not into STRs and SNPs, L21 is a SNP along the human migration path that represents permanent branching. To the best of our knowledge at the moment, the first male to have his "G" mutate to a "C" at location L21 on his yDNA did so about four millennia ago. All of his straight line male descendants have inherited this C.
Now with the new SNP data flowing in from BIG Y and other expanded tests of SNPs along the yDNA, we are able to shrink the four millennia down somewhat. My goal is to find SNPs that have occurred in the last 3 to 5 centuries. 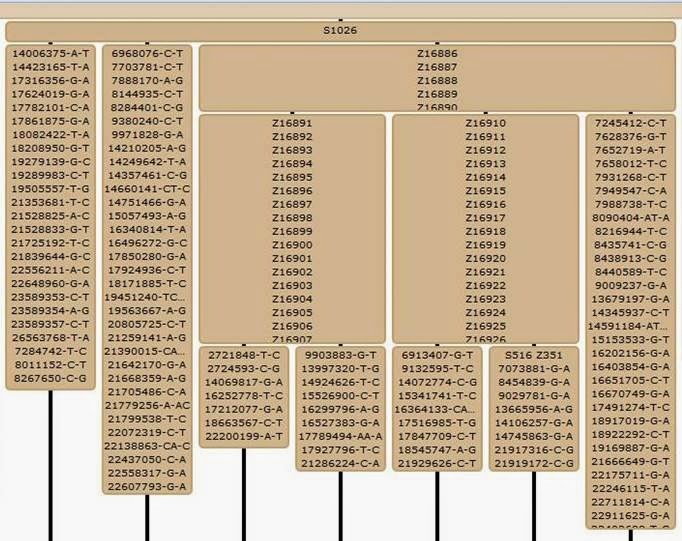 This may help us connect our SNP paths with our STR data and with our traditional genealogical trees. SNP Trail from R1b-L21 to S1026 and even more recently. In the last month we have been closing that gap, but we still have a long way to go. My own most recent SNP is getting closer. Indications are that DF13 (also known by other designations shown in the box above) first appeared about 3,500 years. Now we have SNP S1026 to narrow the gap even further. After that come 5 SNPs in the center box in the chart above. They need a lot of analysis to place them in the proper sequence with each other and in the right historical era. Five of the seven of us who so far have tested positive for S1026 share those five SNPs which are just in the process of being named as I write this post. Then it looks like there are 18 additional SNPs even closer to the present that I share with Herb McDaniel. It will be interesting to see how the results of my cousin George and others help us fill in even more of our time gap. I am not advocating that any of you rush and order the BIG Y or the Full Genomes Y Sequencing tests. These are still vehicles for discovery of SNP trails rather than for finding cousins. STR tests are still better for the latter. If you want to SNP test, your dollars will be better spent if you build on what is being discovered by others. Generally your best strategy will be to find a near or even a distant STR match who has taken one of these mega tests. First confirm the most recent SNP you appear to share by taking a single SNP test. Then consult with your haplogroup or surname project coordinators for suggestions for addition SNPs to test individually. Happy SNP chasing! Although more Americans claim to have German ancestry than any other point of origin, we are not seeing this reflected in the various "ancestral" products from DNA testing companies. 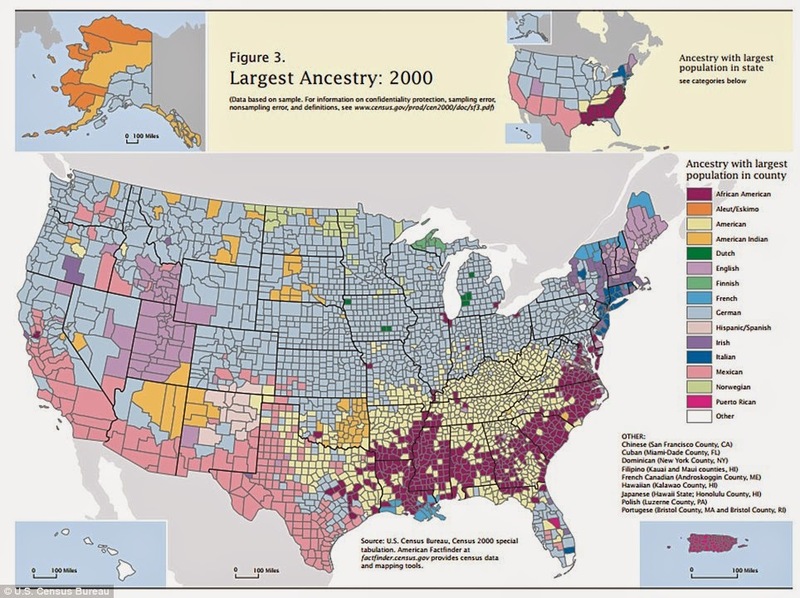 The map below shows the largest claimed ancestry in US counties in the 2000 census. Unfortunately for future genealogists, that data was not collected in 2010. Almost 50 million Americans claimed German ancestry. They were the largest ancestral grouping in the counties colored in baby blue above. The second largest group overall was African-Americans with about 40 million. In spite of this large Germanic presence, this grouping is hard to identify in test reports from Ancestry Composition (23andMe), DNAAncestry and now from myOrigins (FTDNA). The individual whose test results and ancestral predictions are described below descends from 5 (of 8) great-grandparents who immigrated from Germany/Prussia to the Chicago area in the last half of the 19th century. Their points of origin were were in Northern Germany/Prussia from Ostfriesland in the west near The Netherlands to Westpreussen near Danzig. Note that the Germanic ancestry is not very prominently represented in any of them. DNAAncestry combines France and Germany into a category called Europe West. Even if this segment is combined with Europe East, the two do not add up the even half of the expected 62.5%. However, Ancestry did note that the actual component for Europe West could range from 0% to 40% and that the component for Europe East could range from 3% to 20%. However, even if the most generous numbers from each range were taken, this would only begin to approach the expected amount. Ancestry Composition (23andMe), even at its "Speculative" setting does not allocate much specifically to German and Eastern European. Even if all the Non specific European and Northern European were added, it would still be short of the amount suggested by paper trails. With myOrigins (FTDNA in Beta) the predicted origins are also shown to be 78% from the British Isles rather than the continent. I have noted with other individuals in my extended family that the predicted origins seem to overemphasize the Isles at the expense of the areas from whence German-Americans came. This seems to be true whether they originated from the Palatine or from more northern regions. What has been the experience with those in your families? Usually when I see reviews or comments about the various ancestry location predictors, the focus is on one person -- usually the author. 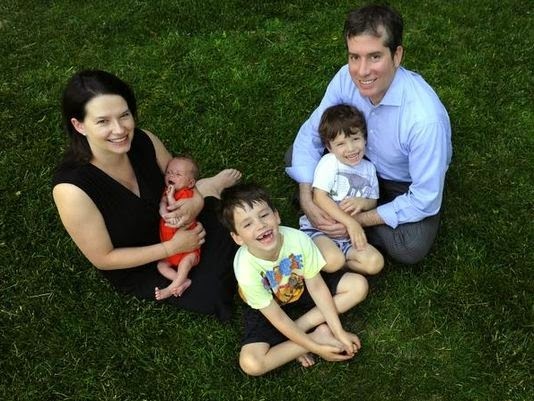 Rarely do we look at whole families. Below are the myOrigins predictions for a family of 4. Such an analysis offers more constraints than those that look only at one person at a time. However, that narrower focus may be a good place to start. Most of you probably know that myOrigins is a new feature being rolled out by FTDNA to replace its now primitive Population Finder. It offers many more than the previous 4 possible populations of origin. It also gives users the chance to review the predicted ancestral distribution for those who are Family Finder matches on their atDNA. This kind of prediction is far from settled science. There is nothing wrong with the genetic analysis of reputable labs. However, it is easy for sensation seekers to make unsupportable claims. The problems are that we often are not told when it was that our ancestors were supposed to have lived in the predicted locations and also that our ancestors were quite mobile -- at least in certain periods. For example Geno 2.0 tries to predict where our ancestors may have been thousands of years ago. Other tests aim just a few hundred years back in time. Much as we would love to know in which postal zone our ancestors lived in during a particular decade, DNA analysis alone is far from unlocking such pinpoint information. If the DNA is trying to place us even 15 to 20 generations back in time, none of us have any clue who all or even most of our ancestors might have been. The most diligent among us may have information about a small percentage of our forebears that far back. This is not to say that information from tests like myOrigins is not fascinating and sometimes informative. However, we need to resist the temptation to swallow it whole. We need to digest it carefully and need to correlate it with information from other sources. In examining the family of four below, it is important to remember that we are examining a known family unit. These are not 4 genetically independent individuals. The general findings for each parent are not inconsistent with what is known about their ancestral origins from other sources. This level of analysis is at best two dimensional. It begins to get more interesting when each family member is compared with each other family member. If we can assume that the predicted information about the parents are generally in a range close to the truth, the predicted information for the children begin to raise some questions. We all know that atDNA is random and that two siblings generally inherit about 50% of the same segment. That could account for some of the variation between the daughter and the son. The values for each child would be expected to be within or near the ranges established by the two parents. If the assumption made in the last sentence is accepted, most of the values for the daughter are not unexpected although her European Coastal Islands component is more than 10% higher than that for either parent. Other than the small Trans-Ural Peneplain result, nothing else about the daughter's results seem to stand out on the face of them. The son is a different matter. His much lower European Coastal Island component than any other family member and his European Northlands component of more double any other family member strain credibility that they resulted from just random atDNA inheritance in only a single. All this might be statistically possible but it strains credibility. It is not my intention to single out myOrigins for a greater levels of scrutiny than we apply to other similar tests. We should be applying them to all such test results. As drawn to these predictions as we are, do we believe they are as ready for prime time as genetic genealogical tools in the way that other DNA tests have become? You may want to tune in to Elise Friedman's webinar on Monday at high noon Houston time for more details about the launch of this new product. 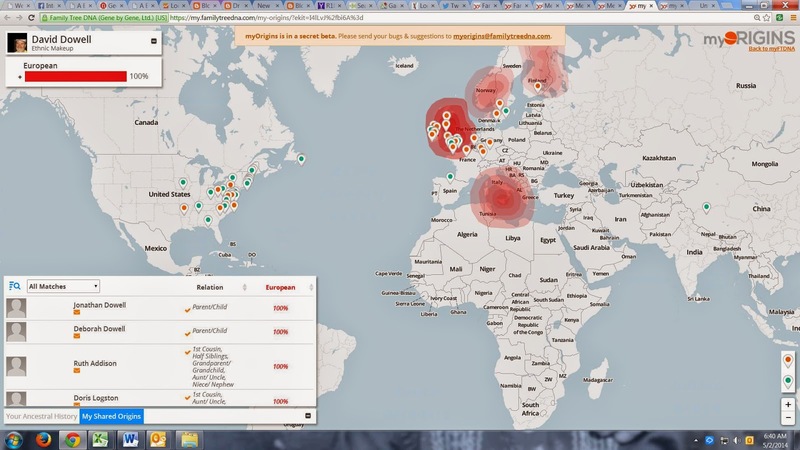 Family Tree DNA's successor to Population Finder, myOrigins is now in secret beta. This is not a review of the product. That will come after I have time to complete a more thorough test drive. At first glance it has many interesting features. If you do have access to the product during the beta test, I encourage you to test it thoroughly and report any bugs or difficulties, along with any other comments, directly back to the design team promptly. All of us will benefit if this product can be made better.